Where do you start with this one? ….. The mascot was happy, we were ‘officially’ cleared for departure! On the bus the air was tense with nervous excitement, anxious glances exchanged between ‘friendly’ rivals, Cj ready, at a moment’s notice, to knee cap anyone who dares talk of threatening his wake and Boycey, as happy as Larry, sporting a grin as wide as the Channel itself, just to be out for a day trip with mates. Quick stop at Dover to pick up the last crucial four members, the A&D wannabees affectionately known as the ‘Green Team’, and we were a full team. 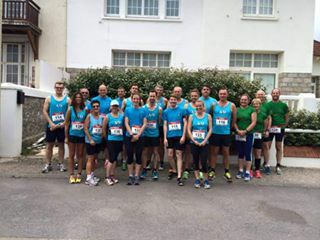 Our arrival at Hardelot was a pretty slick affair, we were ushered to the parking spot of choice, right by race central, running gear donned, extortionate race fees paid, correct and incorrect race numbers attached, awesome team photo taken, hand stands stood, photo bombs bombed and then warm up ……. First home for the club, and picking up the trophy for fastest international male, Cj Lattimer who finished in an admirable 14th, in the field of 665 runners, in a time of 36:19. Chris Boyce smashed his pb as he finished close behind Cj in 18th place in a time of 36:42. Dean Bracken came home next in 40th place in 38:51, Anthony Brown set another pb as he finished 77th place in a time of 41:02. Robin Butler was next in with 41:16 and Neil Buckley in 44:47. Jo Faux took home the trophy for the fastest international female in a time of 46:10. Rhian Shrimplin was the 9th lady finisher in the race with a new pb of 47:26, Jon Wiles ran 47:37, Steve Hickman finished in 49:00, Danyel Giles in 49:05, John Fidge finished in 51:10, Colin Howard finished the course in 51:59, Lucy Cresser in 52:46, Andrew Smith ran a pb in 56:24, Sam Howard in 56:54 and Anne Fidge in 59:49. No bling at Hardelot? ….. WHAT?! ….. I know right! …. Instead we were given an embroidered fleece blanket displaying a rather fancy crest. A bit out of the ordinary but actually quite nice, we even had a choice of colours. Woohoo, come on down! The ladies emerged from the bus, post change, somehow looking nothing short of glamorous. I’m not sure how they do it frankly? Once you eliminate the impossible, whatever remains, no matter how improbable, must be the truth ……. Magic it is then! Shall we have a drink? ……….. WHOOSH! It was quiet in the The Shamrock until we arrived and it would be fair to say we livened things up a teeny tad of a bit. No time was wasted with the important duty of replacing lost fluids. We all drank so much water. Some of the water was an amber colour and fizzy, some was red and still but it didn’t matter, it was all lovely. Midway through this vital replenishment process the doors of the pub swung open to reveal our glorious captains, Jo and Cj, looking like they had just raided the local jewellers. Armfuls of glitzy, shiny trophies gleaming almost as brightly as the smiles on their faces and Cj juggling a cup nearly as big as he is. And so it came to be that on this 5th day of September in the year 2015, A&D had officially robbed our French friends and took home the Hardelot FA Cup for being the most well represented team/club at the event with an amazing 23 runners! What a staggering effort! We took some celebratory team photos with the silverware, Rhian and Boycey broke the hearts of Howards in a sedate, yet mildly competitive, game of table football and Cj’s ping pong prowess took a total table tennis tonking at the hands of Jo ‘Ninja Spin’ Faux! After a certain amount of persuading and near physical manoeuvring, we managed to extract ourselves from the pub and squeeze in a visit to a local eatery. The restaurant clientele were a right rowdy bunch, we could hardly hear ourselves shouting, screaming and tearing up the joint half the time, but with the careful attention of Max, our host and seemingly Boycey’s choice for a boyfriend, we were all eventually fed and even further watered to a level of great satisfaction. Personally I am still a little scarred by the image of Deano and Boycey supping Champagne and Brandy through linked arms like what lovers does!! Still the medication is keeping me stable so no long term harm done hopefully. Nothing at all happened after we left the restaurant. The journey home was an entirely uneventful affair save for Sam Howard forming an overly close and, at times, unnaturally symbiotic relationship with the huge team cup, Boycey consumating his marriage to Danyel by eating her deodorant, Deano casually pointing out that some ladies are perhaps too voluptuous to ride motorbikes by screaming at the top of his voice and banging on the bus windows and Neil Buckley enforcing his human right to empty the water tank at border control but then Eeyore, Eeyore, Eeyoreways does that. Sincere thanks go to all those involved in the organisation and I can not wait for next year where we simply MUST retain that enormous trophy! What an amazing day! Photos of the day can be found here!